In the years after The Man with the Golden Gun, while Roger waited for production to start on The Spy Who Loved Me, he kept as busy as he could and even took a leading role in the 1976 Italian exploitation crime action film Gli esecutori (aka Street People, The Executors, The Sicilian Cross) for producers Manolo Bolognini and Luigi Borghese. It seems rather strange that the current James Bond would be in a film like this but then, to be fair to Rog, his then wife was Italian and the chance to enjoy some weeks in Rome probably seemed like a nice idea at the time. Also, he would be starring alongside the respected American actor Stacy Keach. Street People was not much of a success though and remains arguably the most obscure film of Roger's career. This is not a film I have ever encountered on television. Street People has a somewhat incoherent plot that doesn't make an awful lot of sense at the best of times. Roger himself admitted that neither he or Stacey Keach could make head nor tail of the film while they were shooting it or when they tried to watch afterwards. They hadn't the faintest clue of what they were acting in. In the film, Roger plays Ulisse, the (ahem) lawyer nephew of a Sicilian mafia boss dispatched to investigate a heroin shipment smuggled into San Francisco in a church cross. Ulisse has to find the culprits. Or something like that. The film seems like a vague attempt to be a bargain basement French Connection. If you are wondering how on earth we can possibly accept the easygoing self-deprecating Roger Moore as a hot-headed Sicilian troubleshooter for the mob, well, they do explain that Ulisse had an English education! Helping him in the film is his friend Charlie (Stacey Keach), a racing car driver who is handy with his fists and not a bad chap to have at your side in a tight scrape. The film is more violent than Roger's Bond films - as you'd expect from the Italian action film industry - but exploitation fans might be a trifle disappointed that there isn't just a bit more sleaze, blood and action. The action is rationed far too much although there is a bone crunching car chase in San Francisco and a sequence involving tanker trucks that - bizarrely - anticipates a similar sequence in the 1989 Bond film Licence To Kill with Timothy Dalton. One can only describe the direction in this film as eccentric. Full of bobbling camera shots, gratuitous zooms, and bizarre lens blurs. Even the simplest scene is often shot in a strange way. You do wish this hyperactive camera had got much more action to shoot at times. Roger never seems to have the faintest idea what he is doing in this film and looks like he wants it over with as quickly as possible. You can imagine him on the set constantly glancing at his watch and counting down the hours until he can go and have some dinner in a fancy restaurant. Consequently, in Street People, Roger tends to slip into his standard Bond/Templar suave persona as much as he can although Ulisse is a somewhat less sympathetic character. Roger looks good in his suits and sunglasses though. Stacy Keach probably gives the best performance in the film as Charlie. It helps that he's given a decent amount of humour. Keach seems to have no idea what he's doing in the film either but he's relaxed and charismatic. Stacey Keach can be a superb actor with good material - William Peter Blatty's The Ninth Configuration a case in point. Sadly, Street People is no The Ninth Configuration. 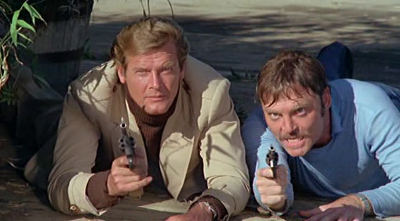 It's strangely enjoyable to see Moore and Keach as an unlikely onscreen double-act and they work fairly well together, much in the manner that Roger and Tony Curtis did as a chalk and cheese double-act in The Persuaders. You tend to wonder if the original idea for Street People had been to re-team Moore and Curtis as a sort of big screen Persuaders. That would have been a lot of fun if they'd managed to stage a Curtis/Moore reunion. One quibble you could have regarding Keach and Roger is that they separate them a little too much at times. The relationship between the pair is slightly vague - like everything else in Street People. The interiors of Street People were shot in Italy and there is some absolutely terrible English dubbing of some of the Italian cast members. The location work in San Francisco is enjoyable though and gives the film a good seventies atmosphere at times. Some flashback sequences come off as somewhat half-baked and pretentious but the music cues are pleasurably melodramatic and dated to modern ears. Street People is entertaining in places and it's interesting to see Roger slightly out of his comfort zone (well, in unfamiliar surroundings at least and playing a very different sort of character) but you can't help feeling that the chance of a minor cult classic was flubbed here by the confused story and a general lack of mayhem and trashy fun. The film delivers some spectacle and bloody-shoot outs but never in enough volume or with the style you'd want. 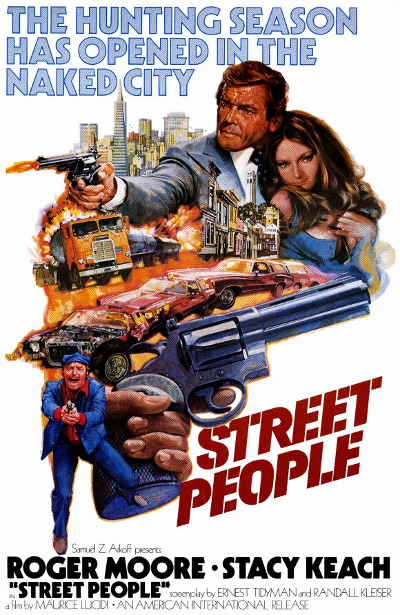 Street People is probably one for the curious and Roger completists only but it's not a complete loss and worth at least one late night watch for the unlikely Roger/Stacey Keach double-act if nothing else.